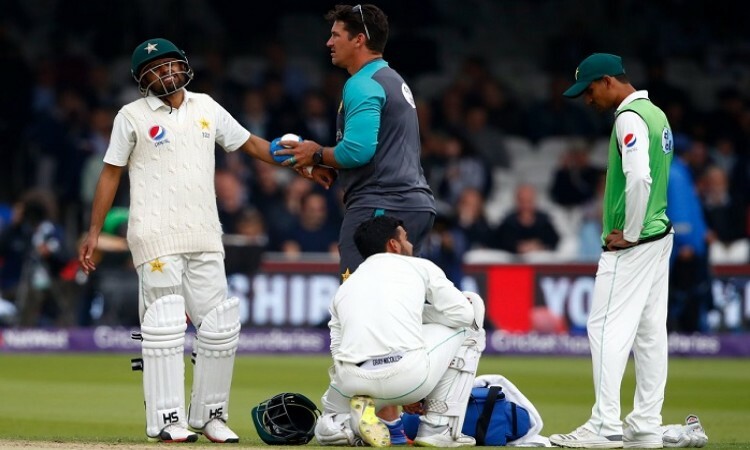 London, May 26 (CRICKETNMORE): Pakistan were dealt a major blow after dependable middle-order batsman Babar Azam was ruled out of the rest of their two-match Test tour of England with a fractured left hand. Azam looked in ominous touch during the second day of the ongoing first Test between England and Pakistan at Lord's on Friday. He top-scored with 68 as the visitors built a 166-run lead, ending the day on a strong 350/8. However, the 23-year-old was forced to retire hurt after copping a blow on the arm from a nasty bouncer by Ben Stokes. He did not go for scans straightaway but did not take the field for the rest of the day. Scans later revealed a fracture that ruled Azam out of action for a minimum of four to six weeks. "We decided we were going to do a precautionary X-ray at the end of the day's play," Cliffe Deacon, the Pakistan team physiotherapist, said. "Unfortunately, the X-ray confirmed there was a fracture." "The fracture's in the forearm, it's one of the two bones in the forearm in the distal third of the arm, just above the wrist. That's why he couldn't hold his bat properly. "Normally with these sort of fractures, recovery varies between four to six weeks," Deacon added. With the likes of Usman Salahuddin, Fakhar Zaman and Sami Aslam already in the side, Pakistan have decided against naming a replacement for the second Test, which starts at Headingley from June 1.